Island and the islands in Kaneohe Bay and off the eastern (windward) coast, it has a total land area of 596.7 square miles (1,545.4 km2), making it the 20th largest island in the United States. Along with the rest of the Hawaiian Islands, Oahu is one of the largest and northernmost islands of Polynesia. In the greatest dimension, this volcanic island is 44 miles (71 km) long and 30 miles (48 km) across. The length of the shoreline is 227 miles (365 km). The island is the result of two separate shield volcanoes: Waiʻanae and Koʻolau, with a broad "valley" or saddle (the central Oʻahu Plain) between them. The highest point is Ka'ala in the Waiʻanae Range, rising to 4,003 feet (1,220 m) above sea level. The island is home to about 976,199 people (approximately 72% of the resident population of the state, with approximately 81% of those living on the "city" side of the island). Oʻahu has for a long time been known as "The Gathering Place". However, the term Oʻahu has no confirmed meaning in Hawaiian, other than that of the place itself. Ancient Hawaiian tradition attributes the name's origin in the legend of Hawaiʻiloa, the Polynesian navigator credited with discovery of the Hawaiian Islands. The story relates that he named the island after a son. The city of Honolulu—largest city, state capital, and main deepwater marine port for the State of Hawaiʻi—is located here. As a jurisdictional unit, the entire island of Oʻahu is in the City & County of Honolulu, although as a place name, Honolulu occupies only a portion of the southeast end of the island. Well-known features found on Oʻahu include Waikīkī, Pearl Harbor, Diamond Head, Hanauma Bay, Kāneʻohe Bay, Kailua Bay, North Shore. Being roughly diamond-shaped, surrounded by ocean and divided by mountain ranges, directions on Oʻahu are not generally described with the compass directions found throughout the world. Locals instead use "ewa" (pronounced "eh-va") to mean toward the western tip of the island, "Diamond Head" to be toward the eastern tip, "mauka" (pronounced "moww-ka") is toward the mountains and "makai" toward the sea. Locals consider the island to be divided into various areas, which may overlap. 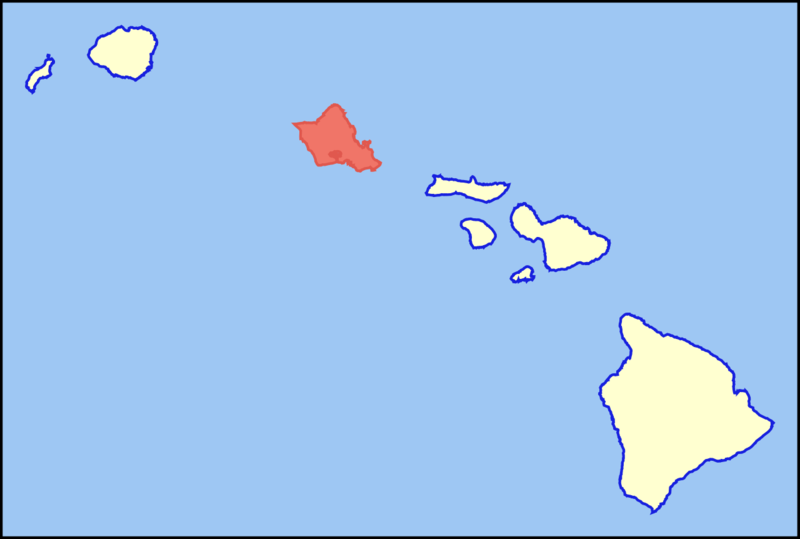 The most commonly accepted areas are the "City", "Town" or "Town side", which is the metropolitan area from Halawa to the area below Diamond Head (residents of the island north of the Koʻolau Mountains consider the Town Side to be the entire southern half); "West Oʻahu," which goes from Pearl Harbor to Kapolei, Ewa and may include the Makaha and Waianae areas; the "North Shore" (northwestern coast); the "Windward Side" (northeastern coast); the "East Side" (the eastern portion of the island, including both the Windward Side and the area east of Diamond Head; and "The Valley" or "Central Oʻahu" which runs northwest from Pearl Harbor toward Haleiwa. These terms are somewhat flexible, depending on the area in which the user lives, and are used in a mostly general way. Oahu is also known for having the longest rain shower in history with over 200 days spent with continuous rain. Kaneohe Ranch, Oahu, Hawaii reported 247 straight days with rain from August 27, 1993 to April 30, 1994. The island has many nicknames one of them being "rainbow state." This is because rainbows are a common sight in Hawaii due to the frequent rain showers. The average temperature in Oahu is around 70 to 85 degrees and the island is the warmest in June through October. The weather during the winter is cooler, but still warm with the average temperature of 68-78 degrees. The windward side, also called the east side, is known for some of the most beautiful beaches in the world. Lanikai Beach on the windward coast of Oahu has been consistently ranked among the best beaches in the world.